On Nov. 2, the Canadian Broadcasting Corporation (CBC/Radio-Canada) celebrates its 80th anniversary. The crown corporation and nation’s public broadcaster set to achieve unique goals since its inception — chief among those has been to ensure that voices from Canada could be heard throughout a geographically vast country, while not being diminished by the power of American broadcasters. The CBC/Radio-Canada has a long history of serving remote communities. It stepped into a role that private media companies saw as unprofitable, says Peter Urquhart, associate professor of Communications Studies at Wilfrid Laurier University. Bruce Gillespie, Laurier associate professor of Digital Media and Journalism, concurs. Both Gillespie and Urquhart recognize CBC/Radio-Canada’s function in building a greater sense of national identity. But the challenges that broadcasters face today are different than those of the early and mid 20th century during the broadcaster’s early days. “There was a mass audience for television in the 1950/60s. Millions of homes tuning in to Hockey Night in Canada in English and French can have a pretty profound affect on the unity and identity of a country,” says Urquhart. This declining audience, says Urquhart, raises criticism of public broadcasters. For example, is it fair for private news broadcasters — that are facing shrinking revenues — to be in direct competition with a state-funded media corporation? “CBC/Radio-Canada has the most visited news site in Canada — perhaps that’s because there’s no pay wall that, for example, The Globe and Mail imposes in order to generate revenue,” says Urquhart. Nevertheless, public broadcasting is hugely important, he says. “When an aspect of a media system isn’t controlled by corporate interests and operates at arm’s length from the government, there’s greater opportunity for the media to do what is expected of it in a free and democratic society,” says Urquhart. Gillespie stresses the gold standard that CBC/Radio-Canada has established. While private broadcasters face declining revenue, Gillespie says that CBC/Radio-Canada has faced its own operating challenges. The CBC/Radio-Canada’s Strategy 2020, Gillespie says, is an attempt by the organization to reorient itself to the type of local news reporting that it started with 80 years ago. Importantly, though, it has shifted its primary focus to digital channels to disseminate news content. Urquhart sees CBC/Radio-Canada’s podcast production as part of the organization’s shift to focus on new digital audiences — programs like Love Me and Grownups Read Things They Wrote as Kids. Canada’s public broadcaster was tasked 80 years ago with building a national identity through cultural and news programing. While the media landscape has changed, the goal to deliver news and programming that connects coast to coast to coast remains a central priority for CBC/Radio-Canada. How well it continues to adapt and succeed in the digital age is a new and exciting part of the crown corporation’s history. The photo used in this story is from the Wilfrid Laurier University photograph collection. 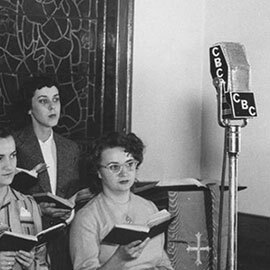 Taken in 1949 or 1950, it shows the Waterloo College Chapel Choir performing in the Willison Hall Chapel, in front of a CBC/Radio-Canada microphone.